Tell Sample Librarian where your sample library is located and it will scan your hard-drives and import information about them (name, duration, sample rate, bit depth, etc.) into its own database. You can then use Sample Librarian's advanced organisation features and "lighting fast" search facilities to find samples you never even knew you had. Browse your samples by many different criteria: the location of the files on your hard-drives (similar to Windows Explorer) or by different properties of each sample (number of channels, bit rate, file type, etc.). One of the many nice features of Sample Librarian is the ability to give samples a rating, so that you can remind yourself that this particular "909 kick" sample is better (or worse) than the other 100 similar 909 kick samples in your library. The History folder is for finding samples you've recently listened to. This is to get around that problem where you know you heard the perfect sample a few days ago that would work just right in your current project, but you've no idea what it was called or which of your sample CDs it was on. Simply click on the "In the last week" folder and you'll see a list of all the samples you've previewed in the last 7 days. Clearly, to find the samples you are after you need some way of auditioning them. Whenever you click on a sample you will see a visual depiction of its waveform, and controls to enable you to listen to the sample. There are also a number of handy keyboard shortcuts to enable samples to be previewed easily, and an auto-preview facility so that samples are automatically played whenever they are selected. Groups are a way to maintain collections of samples that you wish to hold as a group. For instance, samples you want to try for a particular song you're working on. 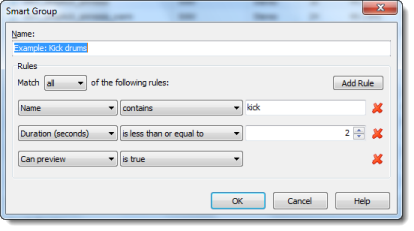 Smart Groups are a powerful automated approach to Groups where, instead of choosing the individual samples to add to a Group, a set of rules is used to automatically determine which samples will be included. For example, you can build Smart Groups that automatically group samples based on their file type, sample rate, rating, and so on. You can also combine a number of such criteria to narrow down the type of samples you are looking for. Apply tags to samples to indicate which Genre they would suit (Rock, Pop, Dance, etc.) or to denote the Type of sample (Drum Hits, Synth Loops, etc.). Sample Librarian comes with a number of tags and categories already defined, but you are free to edit or delete these and add new ones as best suits your needs. 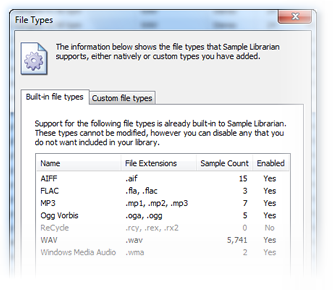 Sample Librarian can import samples of a number of different file types (currently WAV, AIFF, ReCycle/REX, MP1/2/3, OGG Vorbis, FLAC and WMA file formats are supported). 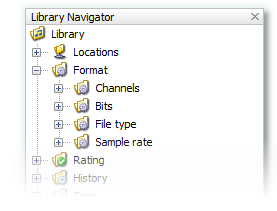 You can also add custom file types, which will allow you to use Sample Librarian to catalogue files that it does not natively support, but for which you would like to use the same cataloguing, grouping, tagging, search and drag 'n drop facilities - but without the ability to preview the files directly within Sample Librarian. Once you've found the perfect sounds for your new song, what next? 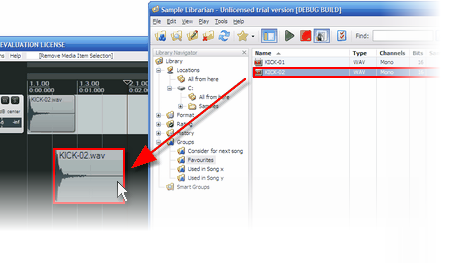 With Sample Librarian it's as simple as dragging and dropping them directly into your DAW. Simply click and hold on a sample within the Sample List and then drag it over to the timeline (or whatever is appropriate for the receiving application) in your DAW and release the mouse button. Note that this feature obviously relies on the receiving application supporting standard Windows drag-and-drop messages, which is the case for the majority of popular DAWs.